20 photos of ships which visited Liverpool in May 2013 to commemorate victory in the Battle of the Atlantic. In May 1943, the Germans had been forced to withdraw their U-boats from the Atlantic after suffering unsustainable losses. The battle was fought between merchant ships bringing supplies to Britain and their naval escorts, and German ships, aircraft and, above all, submarines trying to sink them. It was the longest campaign of World War 2, starting the day after war broke out on 3 September 1939 when the liner Athenia was torpedoed without warning, and continuing almost until the German surrender on 8 May 1945. Some 2300 merchant ships were sunk, most by U-boats, with the loss of about 30,000 lives. Many Royal Navy sailors and Royal Air Force airmen, and their Allies, especially Canadian, also died, as did 20,000 U-boat crewmen. 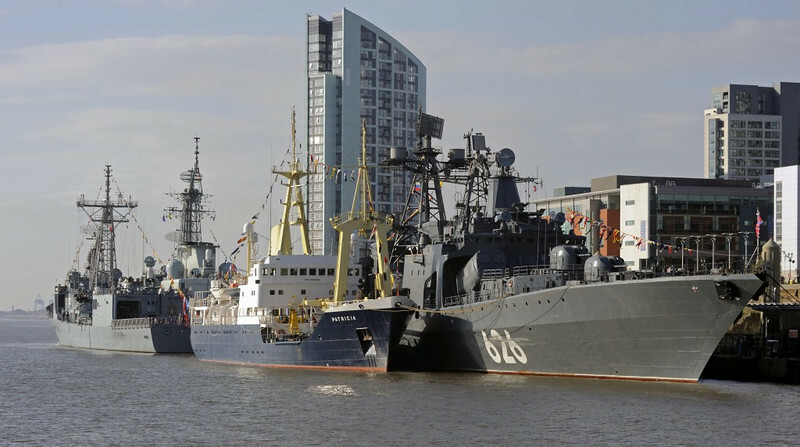 ORP General Tadeusz Kosciuszko (Poland, left), HMCS Iroqois (Canada), THV Patricia (Britain) & RFS Vice Admiral Kulakov (Russia), Cruise Terminal, Liverpool, Sun 26 May 2013. Here are four of the ships which visited Liverpool for the 70th anniversay of Allied victory in the Battle of the Atlantic during World War 2. In May 1943, the Germans had been forced to withdraw their U-boats from the Atlantic after suffering unsustainable losses. The battle was the longest campaign of World War 2. It started the day after war broke out on 3 September 1939 when the liner Athenia was torpedoed without warning; it continued almost until the German surrender on 8 May 1945. Some 2300 merchant ships were sunk, most by U-boats, with the loss of about 30,000 lives. Many Royal Navy sailors and Royal Air Force airmen, and their Allies, also died, as did 20,000 U-boat crewmen.